The strategy game Into The Breach is elegant in its simplicity, but that’s because its designers had to scrap several huge sections of the game that just didn’t work. 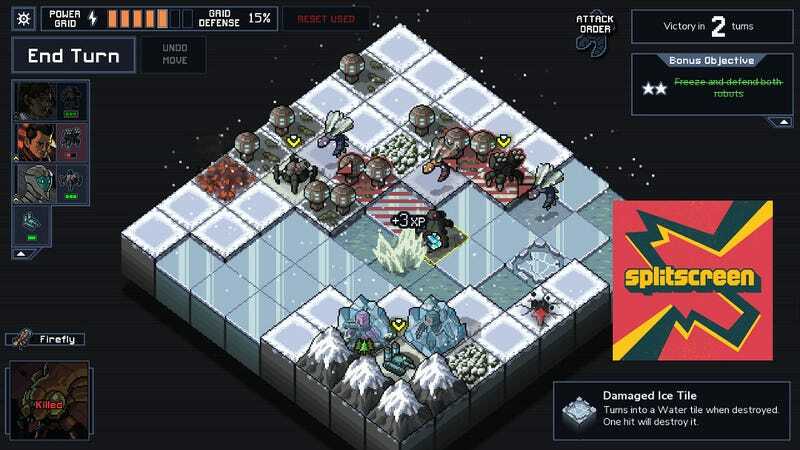 Matthew Davis and Justin Ma, the minds behind FTL and Into The Breach, came on Kotaku Splitscreen during GDC 2019 to tell Jason and me how many times they almost gave up on making their game. In the second half of the episode, we interviewed indie visual novel creator Christine Love (Analogue: A Hate Story, Ladykiller In A Bind) about her decision to make her next game a party-based role-playing game. Get In The Car, Loser! will still have plenty of conversation trees, but it’ll also have actual combat, which is a whole new can of worms. Matthew Davis: You nearly always think, “There’s something here.” And I’m like, “No, it’s terrible.” And we’re back to scratching it all out. Jason: Really? So what was the roadblock? Or was there a “eureka” moment where suddenly it all clicked? Or was it the opposite where it was just like, you were trying to climb this mountain? Matthew: It’s hard to narrow down to one exact thing. Jason: What was the combat part you figured out? Justin: So combat is just literally fighting in the grid. Matthew: What you actually think of when you think Into The Breach. And then you have the island map that has where you select missions and you upgrade your mechs. We had five different iterations on it. Completely different iterations. Jason: Which parts didn’t work? Justin: Everything besides the combat. So maybe 60 percent of the game, we just dropped it all and say, “Okay, it’s just a bunch of missions in a row. Screw it.” We know that the actual combat, which is the entirety of the game as it has released, that was 30 percent of what we were hoping. Matthew: We were hoping for that more XCOM experience where you have lots of missions popping up with times and alerts, and your people get hurt, and you have to devote resources and time to fixing them or healing them. Matthew: We had huge research trees, repairing the cities. Justin: We had the FTL text events where your equipment and your mechs would change the options. Jason: And what wasn’t working about that stuff? Justin: All of it. It was just terrible. Jason: So you’re just playing it and it’s not fun? How do you even know, “It’s not fun because this isn’t working”? Matthew: There is an element of just an intuition that this doesn’t feel right. Justin: Matt would be largely the gut check person. You were coding the whole thing, and so I would be in the trenches of trying to iterate and iterate on micro-design, and then Matt would have a chance to boot it up to play and be like, “This is all terrible.” And we were like, okay. Back to the drawing board. Scrap all of that. Let’s see what we can do.